Fringed yellow-loosestrife is a highly ornamental often sprawling perennial that forms a mass of light green, lance-shaped foliage. This makes it a perfect choice as groundcover, as it prefers a partially shaded position and damp soil. 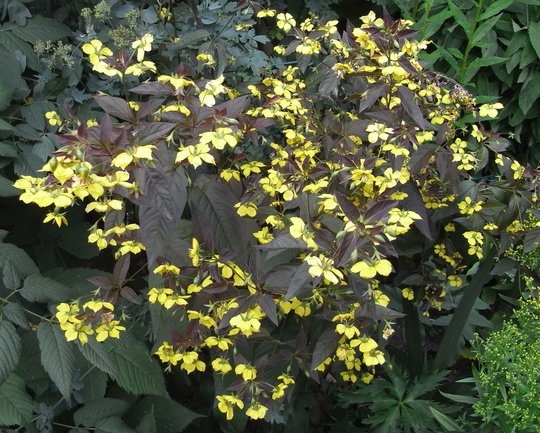 It produces attractive yellow flowers that draw in many species of bees, mainly because it is one of the few species of Lysimachia to offer oil instead of nectar to pollinators. To order this plant please contact us balkanecologyproject@gmail.com. native region: N. America and Canada. Possible suppression of immunity with habitual use. High doses over 1000 mg may cause dizziness. Use of herb for 10-14 days recommended followed by a short break. Perennial growing to 1.2 m by 0.6 m.
It is in flower from June - August. The flowers are unusual in that they bear elaiosomes; that is - they offer oil instead of nectar which is highly attractive to pollinators. Suitable for: light (sandy) and medium (loamy) soils and prefers moist soil. Flowers: Beautiful yellow flowers, opening at different times and often nodding. providing a long blooming period. Highly attractive to a variety of different bee species. Leaves: Plentiful and attractive in appearance and colour. The leaves may have fine hairs along wavy edges, but are otherwise smooth. Loosestrife was once widely used as a medicinal herb, but it has become less popular in modern times. The different species have various medicinal uses. New suckers can be removed easily to keep plant size under control. This plant is notable in that it is one of the few species of Lysimachia to bear elaiosomes; that is - to offer oil instead of nectar as a reward to pollinators. Grows best in fertile loamy soil with plenty of organic matter.